Setting up ‘Static NAT’ is the process of taking one of your ‘spare’ public IP addresses, and permanently mapping that public IP to a private IP address on your network. In the example above I want to give my web sever which has an internal IP address of 192.168.1.10/24, the public IP address of 1.1.1.5/24. So if someone out on the Internet wants to view my website, they can browse to http://1.1.1.5 (or a URL that I’ve pointed to 1.1.1.5 like http://www.mywebsite.com). Then that traffic will be NATTED, on the firewall for me. 1. Create a rule-set from the ‘untrust’ zone. Then add a rule to that rule-set, that has a destination of 1.1.1.5/32, and finally set it to NAT that traffic to 192.168.1.10/32. 2. 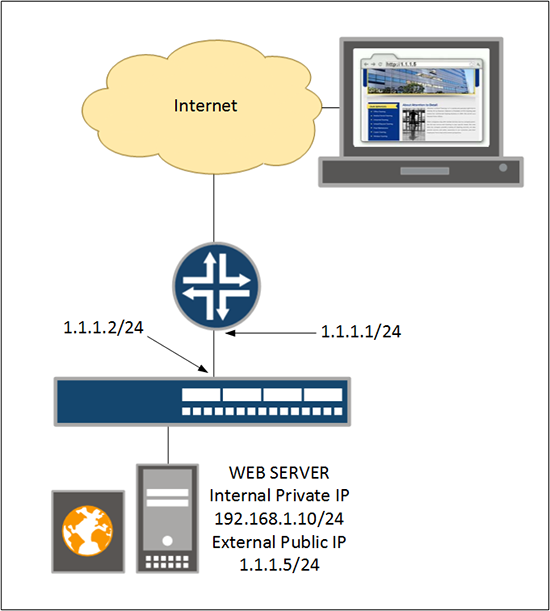 Set the firewall to proxy-arp (advertise your pubic IP address with is MAC address), then add the web server to the global address book. 3. Allow traffic OUT from the web server. Here I’m letting out all ports, if you wanted just web traffic then use the keyword junos-http (TCP Port 80 (http)). 4. Then allow traffic IN to the web server, (here I’m locking it down to just http). 1. Although Juniper have a lot of built in ‘applications’ you can allow, what if you want to create your own? Below I’ll create a custom application for Remote Desktop Protocol (TCP port 3389). 2. You could now use this application in your security policies e.g.